…then he is simply crap at his job. If he is actually aware of this development and chose not to mention it, then he is simply engaged in spreading Islamophobia, which wouldn’t be too much of a surprise. Presumably written by a sub-editor and accidentally left in the published text. 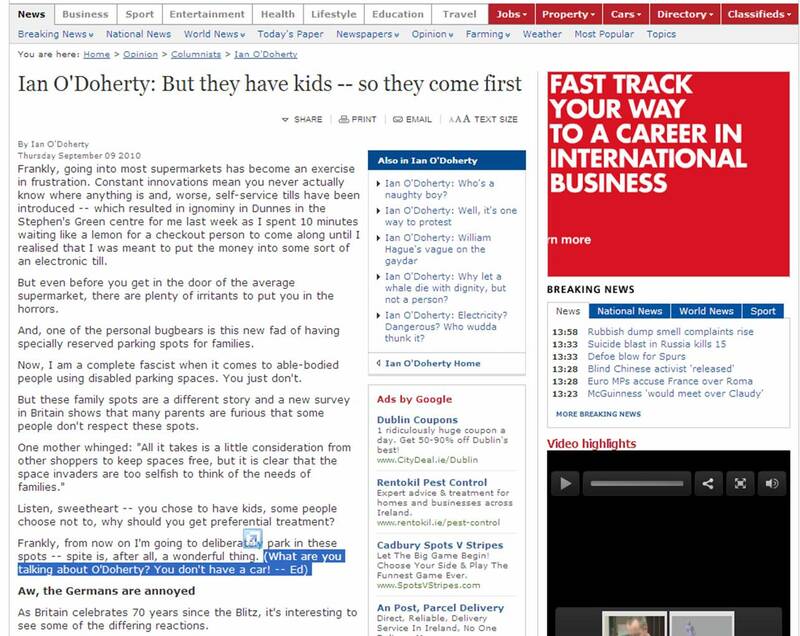 For some reason the breaking news of O’Doherty’s first encounter with self-service supermarket checkouts and his irritation at wider car parking spaces for families reminds me of an article by Brenda Power in the Sunday Times back in May. Power had, by glorious chance, happened upon a woman wearing a burka pushing a pram beneath a billboard displaying the famous Hunky Dory crisp advert, right in the midst of the controversy. This moment of pure chance prompted this article. Also, O’Doherty claims in the article that most aid money sent to Pakistan is “being filtered away by corrupt politicians or the Taliban,” the clear implication being that to send money for relief work is to support corruption and terrorism. The truth is of course somewhat different. The Frontline Club recently hosted a discussion on the issue. There is a clear difference between ‘bad journalism’ and ‘bad journalism’. The first type might be better described as lazy journalism, the kind of thing popular tweeter @badjournalism enjoys highlighting. It’s very entertaining, but it rarely tells us anything particularly interesting about why we read what we read in the newspapers. The second results from a convergence of a combination of ‘filters’. These filters are explained in detail by Herman and Chomsky in Manufacturing Consent: The Political Economy of the Mass Media; and some are discussed in our MediaShots and interviews. Kevin Myers, writing in the Irish Independent, is like cupid to these two forms of bad journalism. Skilfully combining a prior judgement made on a particular issue that fits into a unique right wing anti-pro-whateversuits-authoritarian narrative that the Irish Independent readers allow themselves to be subjected to each day and a wilful use and misuse of facts or things he made up in order to bolster that fundamental. In this particular article Myers has chosen the day when the countries most indebted bank recorded “one of the worst half year performances of any Irish company” (€8.2 bn for the first six months of the year) to lambast government and specifically Green Party governance on the basis of its public transport policy. But in reading a bit further it becomes clear that environmental impact is not so much a concern for our habitat as a tool with which to beat a designated enemy, and it is useful in this respect because of the contradiction it poses for the Green Party’s environmental credentials. “What’s really fascinating is that this proposal emanates from the Greens, because they are committed to public transport by rail as an ideological dogma. But this is not just any kind of rail: it runs underground, which means that a tunnel will be built to Dublin Airport, essentially parallel to the existing, and already under-utilised, port tunnel. Let’s use the Chesapeake Tunnel as a comparison. Its 23 miles required 100 million tonnes of concrete. The Necro North tunnel, however, will probably be one-third the length of the Chesapeake. Let’s be conservative, and call it a quarter. That means 25 million tonnes of concrete, for the tunnel alone, and not including the stations (least of all the huge Dart-Luas underground interchange at the Green). Roughly 20pc of concrete is cement, which means around five million tonnes. But cement-manufacture is one the most CO2-intensive processes known to man. So, making five million tonnes of cement releases some four millions tonnes of carbon dioxide into the atmosphere. The first question that came to my mind was whether the Chesapeake Tunnel is actually the real name of a tunnel or whether it was another humourless renaming of a tunnel, namely the Dublin Port Tunnel. Well, as it happens there is a Chesapeake Tunnel. 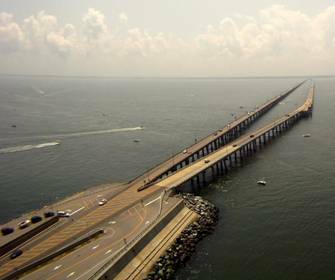 It’s full name is the Chesapeake Bay Bridge-Tunnel, built in 1964 and connecting “Virginia’s Eastern Shore with the Virginia mainland at Virginia Beach near Norfolk.” That’s Virginia in the United States by the way. And, as far as I can tell there isn’t another Chesapeake Tunnel anywhere else in the world. A strange choice of a comparison perhaps, but lets not get suspicious just yet. So the tunnel section of this particular piece of infrastructure is only two miles long. That poses a little bit of a problem. It is quite difficult to make a like for like comparison if the projects are entirely dissimilar. Now I don’t know where Myers’ figure for “100 million tonnes of concrete” came from, but it likely has a lot to do with the 5,189 concrete piles used to support the 20 km long bridge over water with a depth between 25-100 ft. But that’s entirely irrelevant, you just simply can’t compare a bridge with a tunnel. On the other hand the Dublin Port Tunnel (DPT), you would have thought, is a more appropriate project to make the sort of comparison Myers is attempting. So that’s 3,037 rings multiplied by six segments at 8 tonnes and one at 2.3 tonnes, which works out at 152,761 tonnes. If I was a paid journalist and my articles were read by up to 560,000 people I’d probably go and check all these figures with the sources, but I’m not, so I won’t. According to another report, a press release provided by DPT, the rings are about 1.7m wide, which seems about right. So that means 3,037 segments covers 5.16 km (the total length of the tunnel is about 9km, twin bore, but presumably the cut and cover sections are constructed differently, either way, it doesn’t matter the section weights are all that applies). Now, the proposed Metro North includes approximately 10 km of tunnel, requiring 5,882 segments. Therefore based on the above figures, that works out at 295,864 tonnes. Which is about 24,704,413 tonnes less than Myers’ estimate. 20% of this figure is 59,172 tonnes and if “making five million tonnes of cement releases some four millions tonnes of carbon dioxide into the atmosphere” then making 59,172 tonnes releases some 47,338 tonnes of carbon dioxide into the atmosphere. Which, if you hadn’t guessed before reading it, makes the rest of the article complete and utter balderdash. 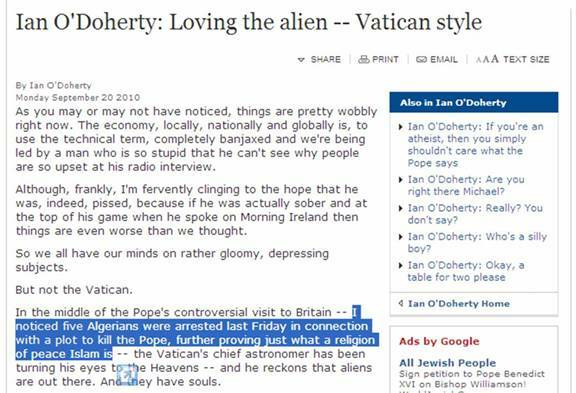 But what does this tell us about the Irish Independent? Very little we didn’t already know.